Preliminary ProceduresRemove the intake manifold sight shield.Recover the refrigerant. Refer toRefrigerant Recovery and Recharging.Remove the heater inlet hose from the heater core tube. 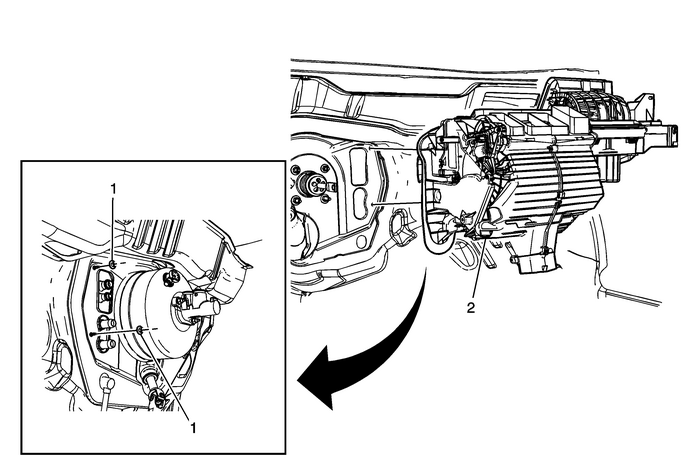 RefertoHeater Inlet Hose Replacement.Remove the heater outlet hose from the heater core tube.Refer toHeater Outlet Hose Replacement.Remove the evaporator hose assembly from the thermalexpansion valve. Refer toAir Conditioning Evaporator Thermal Expansion Valve Replacement.Remove the instrument panel carrier. Refer toInstrument Carrier Replacement. With the aid of an assistant, remove the heater and airconditioning evaporator and blower module from the vehicle.